EA just rattled our mailbox, let us know when Mirror's Edge will be out. If you're in North America, the date's November 11. If you're in Europe, the date's November 14. Good news! Oh, good news with a catch: those dates are for the 360 and PS3 versions. The PC version's been pushed back until "later in the winter". Bummer. Additionally, they announced that a console demo will be made available prior to the game's launch, though a date wasn't disclosed. Presser follows. Guildford, UK – Sept 18, 2008 – Take a leap of ‘Faith' this November! DICE, an Electronic Arts Inc. studio (NASDAQ: ERTS), today announced that the highly acclaimed first-person action adventure title, Mirror's Edge™ will ship on November 11th for the PLAYSTATION®3 computer entertainment system and the Xbox 360® videogame and entertainment system. The PC version of Mirror's Edge will ship later in the winter. Prior to launch, players worldwide will get an early peek at the game when the demo* becomes available via Xbox LIVE™ Marketplace and PLAYSTATION® Store. The demo will feature the prologue of the game including the tutorial and a segment of the single-player story mode. Starting September 26th, players who pre-order Mirror's Edge at selected retailers will get an exclusive code that unlocks the Time Trial mode in the demo. Time Trial mode challenges players to find the fastest route across the rooftops and through the streets. Players can upload their best time to the Mirror's Edge leaderboards for their friends to download and compete against. Players can see their friend's ‘ghost' run as they race their way through the course to the top of the leaderboards. "Mirror's Edge is bringing something new to the action-adventure genre this holiday by putting the player in the shoes of the hero, seeing what she sees, feeling what she feels," says Owen O'Brien, Senior Producer, DICE. "We wanted to create an entirely new experience, with a different type of heroine and a world that not only looks fresh and new but has unique gameplay." Mirror's Edge was recently awarded "Best Xbox 360 Game" at the recent GC Developers Conference in Leipzig, Germany. It also received the "Best Action Game" of Electronic Entertainment Expo (E3) by IGN and the Game Critics Award for "Best Original Game" at E3 in July. 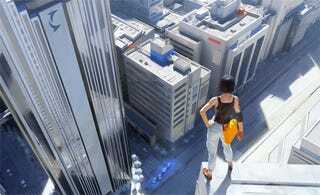 Mirror's Edge delivers players straight into the shoes of Faith, a modern day heroine who traverses the vertigo-inducing cityscape, engaging in intense combat, fast-paced chases and challenging puzzles. With a never-before-seen sense of movement and perspective, players are drawn into Faith's dangerous world. Mirror's Edge is being developed at EA Digital Illusions CE AB (DICE) in Stockholm, Sweden. The game is rated "T" by the ESRB and "16+" by PEGI. For more information on EA DICE or Mirror's Edge, please visit www.ea.com, www.dice.se or www.mirrorsedge.com.